№1 Sand Repel Beach Blanket / Outdoor Blanket. Family Friendly 20% Over-Sized 7x9 Feet. Crafted using Premium Parachute Ripstop Nylon. 4 Sandbag Anchors. 4 Tie-Down Loops PLUS Stakes. 2 Pockets. 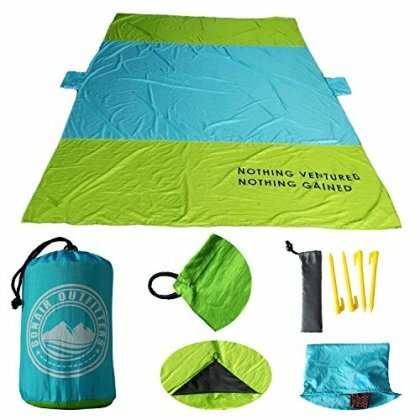 Most-Complete Sands Repel Beach Blanket Package -- Proudly crafted with sands repellent and super strong PARACHUTE RIPSTOP fabric. Sands naturally roll off blanket. Also features Quick Dry nylon to keep you dry by the water. Extremely Lightweight -- Lighten up your load to the beach or the park with ultra-lightweight beach blanket. 90% lighter over traditional beach blanket. Extremely Big -- Enjoy your time at the beach with more friends and family. Bonair beach blanket is family friendly and 20% oversized at 7x9 feet. Big enough for the whole crew. Stay Anchored and Stay in Comfort -- Two ways to anchor beach blanket: tie-down with stakes for picnic in the park or use 4 integrated sand bags. 2 additional Velcro bags for your valuables such as phone and keys. Velcro bags can be used as sand bags.